It is very interesting to watch the Hummingbird feed. They will eat up to 8 times per hour. However, each feeding session is only going to last from 30 seconds to 1 minute at a time. The majority of the diet for the Hummingbird is from sugar. They consume the nectar from the flowers. They also find sugar from tree sap. In many locations there are species of Hummingbirds that consume pollen and small insects. They do prefer sugar though and that is what they will get when they can. However, they are opportunistic so they are going to dine one what they can in order to survive. The Hummingbird doesn’t have the ability to smell at all. Many people think that they find food sources by smell but that isn’t the case. They also have the ability to slow down their metabolism when food sources are very hard to find. Many experts believe that this is a form of evolution that has helped these birds to be able to survive over the course of millions of years. When food is plentiful though these birds will consume up to 3 times their body weight daily. They have a grooved tongue that is designed to help them consume nectar and other types of food rapidly. They have a long tubular like bill that is designed specifically for their dietary needs. 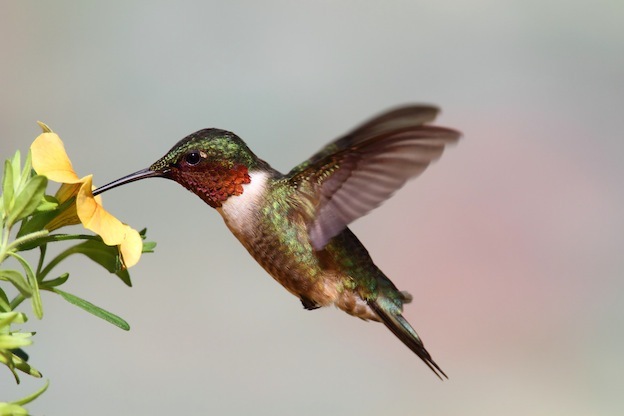 Instead of a stomach the Hummingbird features a sac element that is in their throat area. That is where they will store the food that they consume until it is taken to the small intestine. They seem to often be in a frenzy state when it comes to eating. It is very common to find humans with bird feeders on their property. If they want to attract Hummingbirds though they have to bypass the bird seed. There are many feeders though for nectar that are great for the Hummingbirds to be attracted to and they will come along to dine on a regular basis. That makes observing them fun and simple. Some people have heard that they shouldn’t have a nectar feeder out for these birds though. The rumors indicate that by doing so it can mess up the migrational pattern for the birds and that they will stay behind and die from the extremely cold temperatures. Studies show that this isn’t true though and the Hummingbirds will instinctively move on to warmer temperatures when they need to. Such studies do show that the food ensures that more of the Hummingbirds will be able to survive. They often double in body weight in order to survive the migrational process. For those that can’t find enough food though the journey will prove to be too much for them. Many people fail to realize the value that the Hummingbirds offer in nature too. There are many different types of plants that they pollinate as they consume nectar from them. Many experts believe that there are quite a few types of plants out there that can only be pollinated by this type of bird. There are species of Hummingbirds that will visit at least 1,000 plants per day for consuming nectar so their role in pollination is huge. Studies show that Hummingbirds seem to be attracted to the color red. Those are the flowers that they will go to first for nectar. It isn’t fully understood why they seem to be so attracted to that particular color for feeding. Studies do show that when there is plenty of food they will bypass other colors of flowers and consume from the red ones.